Designed to meet the exacting standards required for high quality production line use. Lobo’s rip saws are manufactured to precise tolerances and feature the newest designs for operator safety and volume production. All these features combine to show what a true value these machines are in today’s highly competitive market. Precision fence ensures absolute accuracy between blade & fence, equipped with measuring ruler gauge. Double anti-kickback fingers mounted at the infeed side provide maximum safety protection. Heavy-duty industrial motor for powerful cutting capacity. Ruggedly constructed cast iron frames for durability usage. The variable feed speed enables the machine to meet different requirements of work. V-way track and chain block surface are heat-treated for long wear resistance. Automatic lubrication to V-Way track facilitates chain running smoothly. The auto lubrication device is equipped with an alarm that sends signals upon a lack of lubrication oil to increase the durability of the machines. 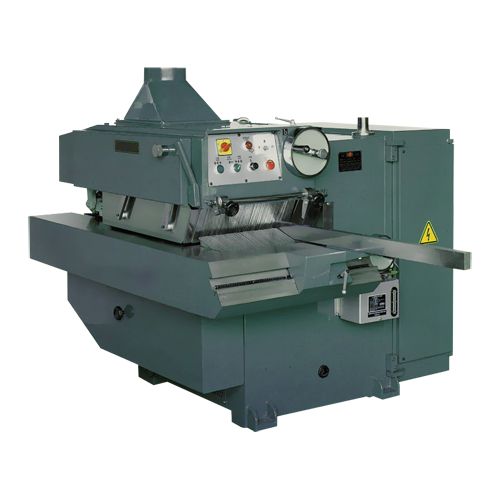 Precision built saw head ensures accuracy for straight line rip saw operations. Four bearing spindle mount ensuring rigidity & long life. Four pressure rollers & two hold-down plates for precise cutting of large and small workpieces. 10 Pc’s V-Belt ensuring maximum motor output and guarantees heavy duty multiple rip cutting. The saw arbor is manufactured from NI-Cr-MO alloy steel for durability and anti-fatigue, heat treated, precision ground, balanced providing precise cutting performance. Adjustable guide rollers make cutting straight for slight radials material. They also secure glue joint for short pieces or long stacks.